Goal conversion tracking is one of the most efficient ways to measure and improve your business objectives. 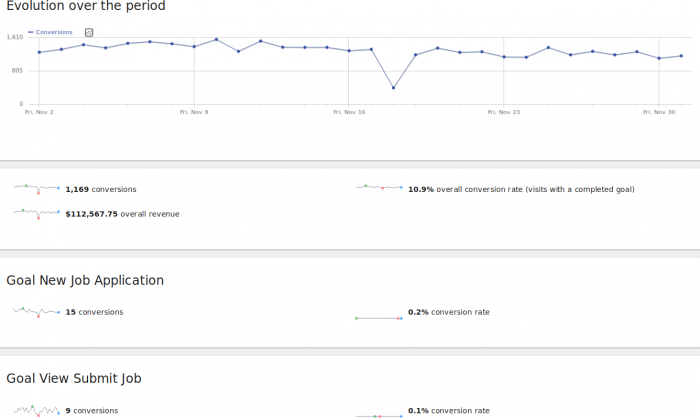 For Ecommerce shops, you can use Analytics Ecommerce reporting. A Goal in Matomo (Piwik) is your strategy and priority. It can entail many things: “Sold item”, “New customer”, “Downloaded brochure”, “Contacted us”, etc. What do you want your users to do on your website? Conversion tracking is a great way to identify whether you are meeting your current business objectives, identify new objectives, view and analyse your performance, and learn how to increase your conversions, conversion rates, and revenue per visit. Goals can be triggered based on user actions (download or plays a video, for example), or when user visits a given page (e.g. checkout.html, thank-you-for-your-purchase.html), or when user do specific actions or events (such as clicking on a button). Goal tracking is also very useful to measure performance of SEM Campaigns and their conversion rate, to the campaign and the keyword level. Ecommerce tracking – to track and get useful Ecommerce Analytics reports, we recommend using the Ecommerce Analytics functionality. Goal Name. The Goal name describes your business objective eg. “Signup”, “View product demo”, etc. Goal Revenue (optional). When you specify a Goal revenue, Matomo (Piwik) will report both total revenue and revenue per visit for each Goal. It is a good exercise to try and evaluate how much money each conversion is worth. For example, you could create a “contact product” Goal to see how many times people have asked for more information about your product. If you know that 10% of these contacts end up as customers, and you sell on average of $100, you know that each “Contact product” Goal conversion is worth on average $10.If you want to set a different revenue for each conversion (for example depending on which “plan” is being bought), read below. By default, a goal can only be converted once per visit maximum, but when editing your goal you can select “Allow goal to be triggered more than once per Visit” to allow your goal to be converted more than once per visit. A visit that converts one or more goals is reported as a “Visit with conversion”. A same visit can convert several Goals (eg. “Buy a product” and “Contact support”). Note that Goal tracking is not retroactive: when you create a Goal, you will see the Conversion data only for future visit data (your historical analytics reports before you created the goal will not be contain the goal data). This report provides a quick glance at all goals defined for the website. 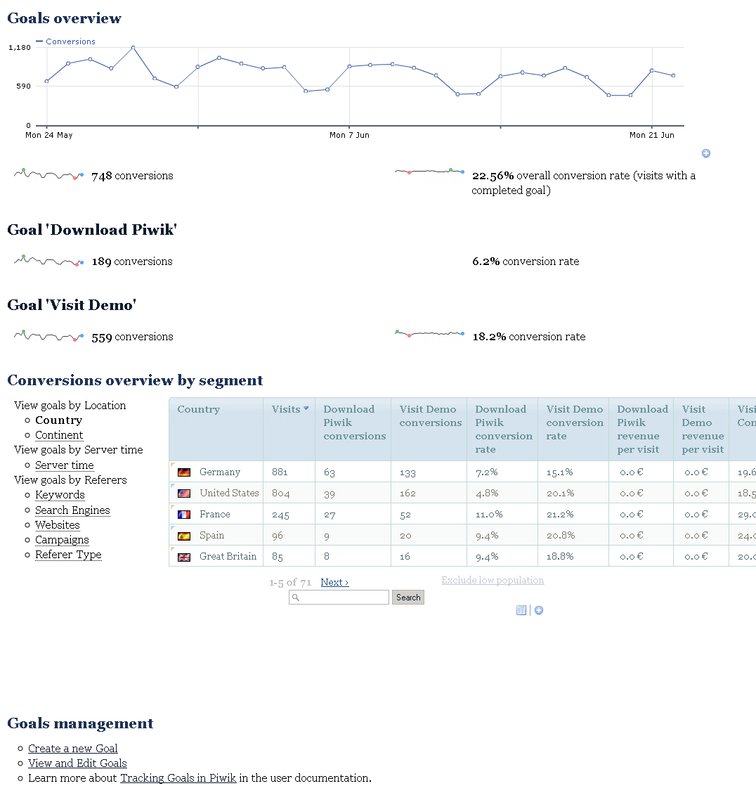 You can also see reports by Country, Keyword, Websites, Campaign keyword, with all columns showing the goal metrics – conversions, conversion rate and revenue per visit – for all goals. The Goal report displays detailed reports about a specific goal. The graph of the last 30 days shows the evolution over time. Matomo (Piwik) also displays a quick summary of the segments that converted best for this goal. You can also access the report table, broken up into the following sections: Countries, Continents, Websites, Search Engine, Keywords, Campaigns, Time of day. Matomo (Piwik) Goal reports will help you answer some of these questions (and more!). You are buying advertisement on Google, Yahoo and Facebook. How can you measure the quality of the traffic sent by these ads, which campaigns and which keywords work best to convert visitors? Out of all of the websites bringing you traffic, which websites send you visitors that convert most? Can you develop stronger links with these websites, or find similar partners? 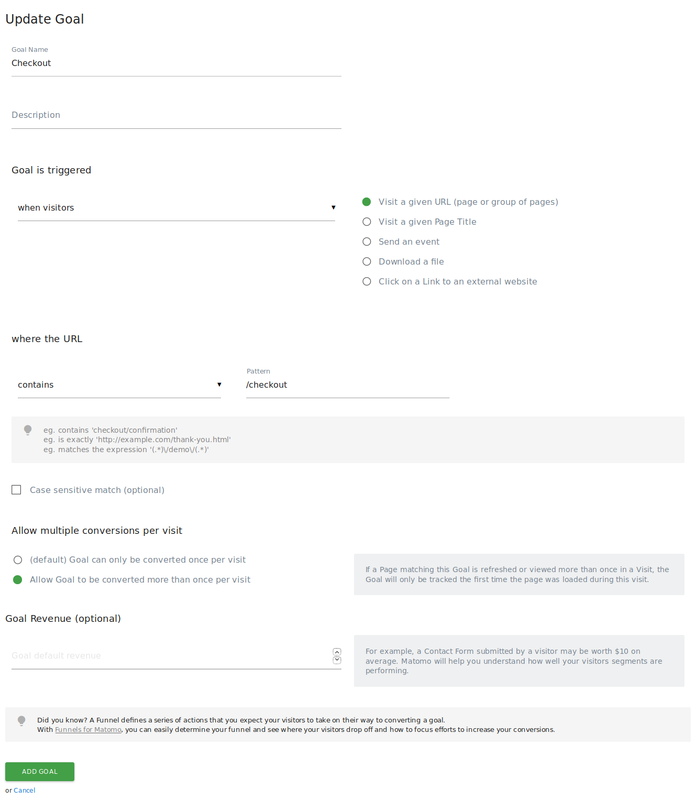 If you use Matomo (Piwik) Campaign tracking, you can track the performance of your Newsletters, PPC Campaigns and keywords to see how each contribute to your Goal conversions and overall revenue. 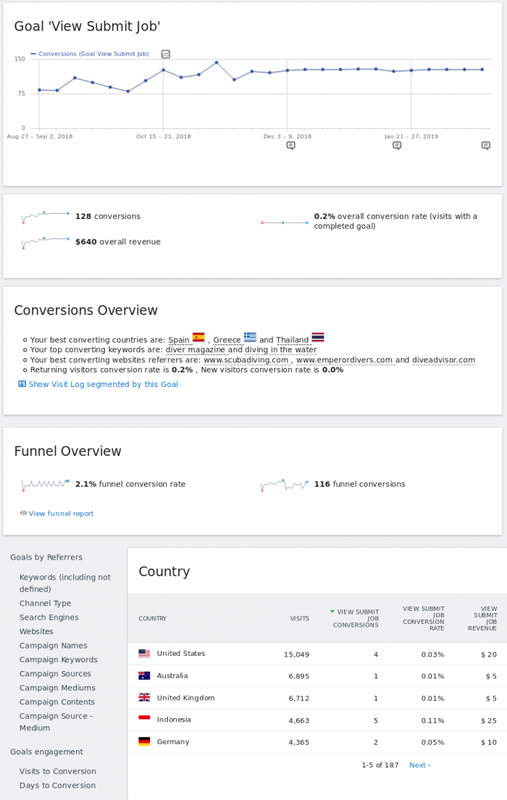 You can see exactly the revenue and conversion rates for each campaign and keyword. If you have affiliates linking to your pages, you can see exactly which affiliates bring you visitors with the most conversions and/or which have the highest revenue per visit. What time of day sees the lowest activity? By checking Goal conversions by hour, you can decide what time is best for migrations and system updates. Goals can be defined with a default revenue, and each Goal conversion will use the default revenue. It is common for “Goals” on a website can have a different revenue. For example, if you sell a service there might be “Bronze”, “Silver” and “Gold” package. 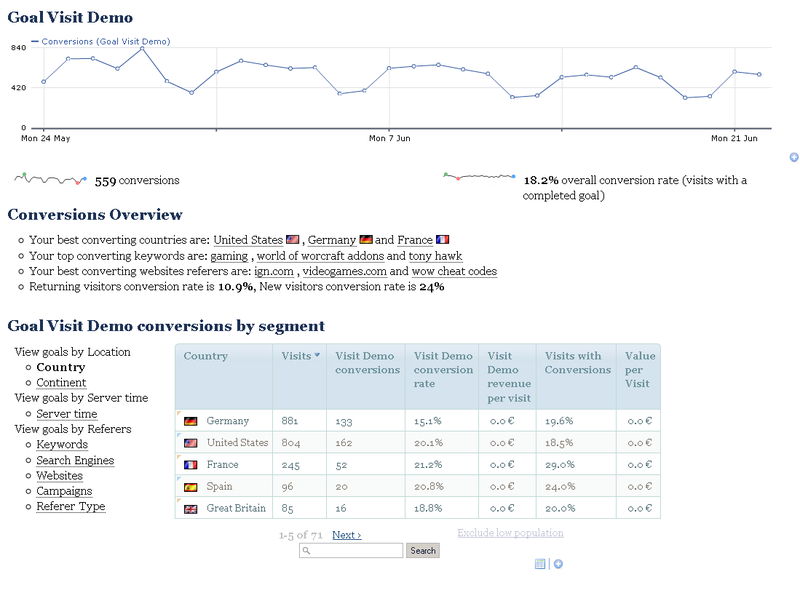 You would want Matomo (Piwik) to report accurately your Goal conversions and revenue per visit for all visitors. Important Note: if your website is an Ecommerce shop, or if you sell various products with different prices, we highly recommend that you use the Ecommerce Analytics functionality instead of Goal tracking. Ecommerce in Matomo (Piwik) is deeply integrated and produces reports tailored to Ecommerce activity. If you are only tracking only one product (with different prices), you can use Goals as a simple yet efficient way to measure your performance and evolution over time. Create a goal “Package ordered”. Set “Allow multiple conversions per Visit” to “Allow goal to be triggered more than once per Visit”. This will ensure that if a user makes several orders per visit, Matomo (Piwik) will track one goal conversion for each order. Look at the goal id, which can be found in the first column of the “Edit goals” table. The variable priceOfMyObject can be dynamically set by your website software. 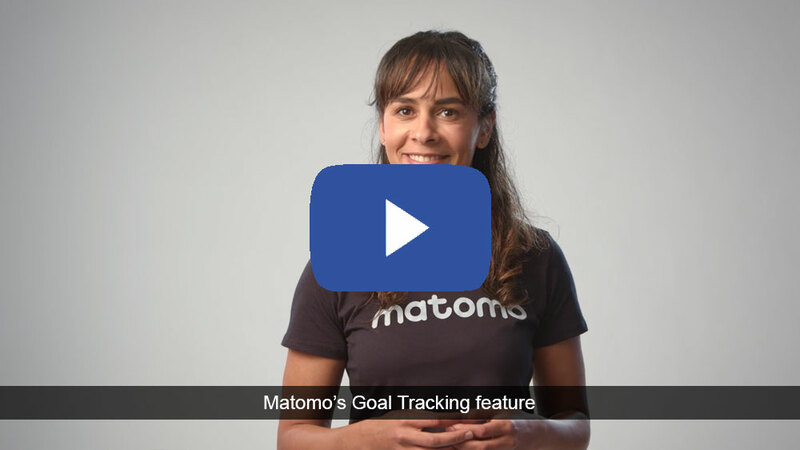 Check out the live example of Goal reports in the Matomo (Piwik) online demo. We hope you enjoy Matomo (Piwik) Goal reports, and we wish you all the best for reaching your business goals & objectives with Matomo! A Funnel defines a series of actions that you expect your visitors to take on their way to converting a goal. By defining a funnel, you can improve your conversion rates, sales and revenue as you can determine where you lose your visitors in converting your goal. Learn more about all the benefits and features of Funnels. Here is what the Funnel reports looks like, for a conversion goal “Applying for a job” (the website being measured is a Job Board). When you view a goal report, you often want to know which channels (or referrers), have contributed the most to your goal so you can adjust your marketing accordingly. By default, Matomo (Piwik) attributes the conversion to the last seen referrer. However, in reality, many users will visit your website several times and only looking at the first or last referrer would not actually give you the true value of the different marking channels (website referrers, search engines, campaigns, …). Using the Multi Channel Conversion Attribution premium feature, you can easily find out which channels or referrers actually contribute the most to your success and it prevents you from spending your marketing efforts and money on the wrong channels. Learn more about all the benefits and features of Multi Channel Conversion Attribution.